They were very friendly and experienced. We had a lovely time and would recommend anyone to stay here. We hope to stay here in the future. Thanks for a relaxing vacation. You have a wonderful team! Everything was great. Pools were perfect for families with young children. Service staff was outstanding and very helpful. They were more than helpful and friendly. Made things much more pleasent and easy. We had an excellent time and will certainly be back. Beautiful and perfect for our needs! My family rented two condominiums for seven days. The 9 adults and 1 child loved the short walk to the beach and being able to watch the gulf from our balconies. Some of us went deep sea fishing and we enjoyed fresh fish cooked on the condos' grills, it was delicious. Everything was so convenient, the accommodations were beautiful and comfortable. No one wanted to leave. When I called the very first day to book, Allison was EXTREMELY helpful. She was informative, knowledgeable and went above and beyond to find the perfect property for my husband and I. At check-in everyone was friendly and courteous. We were in and out in 5 min. We cant wait to book again next year! The stay was perfect! It was quiet and peaceful. We wanted to stay somewhere nice but not to crazy with tourists. Navarre and Navarre Properties was the perfect honeymoon getaway for us! Like I said before. The lady that helped me book the condo was the best person I have EVER dealt with in customer service. The rest of the Navarre Properties crew was amazing. You have a top notch team. Everything was more than I could ask for in a vacation rental. Thanks to Navarre Properties I will never forget my 43rd birthday. 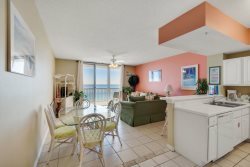 From the time I picked up the phone and called Navarre Properties until the time I checked out it was the best experience I have had renting a vacation rental. The beach was stunning with beautiful clear emerald green waters. The condo was amazing with everything we needed and then some. We will definitely book with you again. It was so wonderful I sent you a thank you card. It was an incredible condo. Everything was beautiful and very comfortable. Peg leg Pete's in Pensacola is fabulous place to eat as well as McGuires in destin and short drive. Wish we had stayed longer and next time we will. Thanks for a wonderful time. The staff was super friendly and very helpful in giving us information about things to see and do in the area. They seemed to take a genuine interest in us and displayed a genuine concern in our satisfaction and comfort in our stay. "We NEVER wanted to leave" might be a good summation of our experience. Had we had more time, we might've started looking for a place to live in or near Navarre. The property was perfect and everyone we spoke with (on AND off the property) was extremely friendly. We'll DEFINITELY be back!! Check in was fabulous. One of the staff called to make sure we were on our way, and was very friendly. Gave us directions to the office. I love Beach Colony. This is the 5 th time I have stayed here. I will always choose Beach Colony due to the cleanliness of the rooms, the location and the overall beauty of the site.